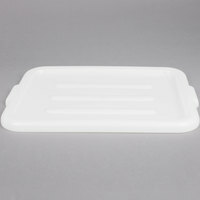 These Polyethylene Lids fit their counterpart tubs perfectly. Once attached to tub contents can be moved with no worry about spilling. Only improvement would be a latch lid that locked the lid to the tub. These lids have held up really well after several months of use. I have around a dozen of these and none have shown any signs of wear. The seal on the bins is not great, but enough for storage of most things. With these lids on, the bins stack very securely. Smoother surface than the lids we had previously, and thus easier to clean!! We love being able to stack out foods in the cooler to save storage! These are the perfect lids for the bus tubs. These fit nicely and stack in little space. They are tough plastic and easy to keep clean.